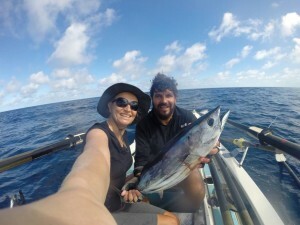 A South African duo have become the first people to row from Africa to the U.S. across the Atlantic Ocean, and all without a support team. Riaan Manser, a professional adventurer, and his partner Vasti Geldenhuys arrived in Miami around midday. The pair’s epic journey began in Agadir, Morocco, last December. More than 5,000 miles and many aches and pains later, they’ve spent upwards of 100 days on board their 23-foot-long rowboat, named The Spirit of Mandiba in honor of former South African president Nelson Mandela. Along the way, they used Twitter to keep people around the world informed of their progress and problems. The massive wave threw Manser into the ocean but he managed to cling onto a rope hanging off the side of the boat and haul himself back up. Geldenhuys was unable to help because her feet were trapped under equipment. Before arriving in Miami on Wednesday they had trouble on a much smaller scale — a near run-in with the U.S. Coast Guard, who thought they might be Cuban refugees. Their journey isn’t finished yet: their final destination is New York City. They aim to arrive on May 23.